One of the greatest things about being a little kid is that you have happy places and you can be very vocal about these places that make you jump with joy. And you’d spend the day jumping off the raft in the middle of the ice cold lake with your cousins, sprouting new freckles, yelling “Race ya!” and dodging the slick fish that swam around your legs and made you kick like a frenzied frog all the way to the old wooden raft that’s been there since your dad was a kid. There was your best friend’s house where you’d go nearly every day after school because her mom would say to you both “Hello, girls, shoes off, wash hands! (even before she could SEE your hands!) and by the time you got to the table there would be warm Oatmeal/butterscotch cookies and cold, cold milk (How did she get the milk THAT cold?) fixed just for you two and her little brother. When you were a teenager, it was basketball games played at Home on Friday night with your best friends eating popcorn and drinking Coke, flirting with the guy that you would eventually go to Prom with. In the dead of winter I would think of our one week at Hampton Beach as the happiest place I’d ever known. And in the quiet of her office, with a blanket around me, I felt safe. I closed my eyes and thought of my favorite place. I’ve been lucky enough to have traveled almost a million miles. I’ve seen places I couldn’t have imagined as a little girl growing up in a trailer park. I tell her of a place that is closest in my heart- a turquoise pool with palm trees that glow against an orange daiquiri colored sky. It is here that I would sit on a chaise lounge in the morning after running on the treadmill in the fourth floor indoor/outdoor gym and enjoy an espresso while watching the sun rise. It is a place I have stayed at hundreds of times over the past ten years, mostly for work when I was covering movie junkets and meetings with studios and agencies in Los Angeles. It is a place where I feel at home, a place where I feel my stress leave when I pull into the driveway. When I hear “Welcome back to the Four Seasons, Miss Johnson” I am chill, I am blissed out, I am in my Happy Place. 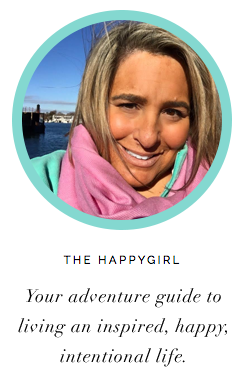 As I was thinking about the new Happy Places feature for The Happygirl Experiment, there was no question which place would be the premiere destination. It had to be The Four Seasons Los Angeles on Doheny Drive in Beverly Hills. The Four Seasons Los Angeles is a place where I spent almost every weekend for 10 years and before you say it, yes I realize I am a lucky girl. This Four Seasons location is well known for their celebrity guests but you'll feel like a celebrity even if you are just a star in your own universe. Yes, there are some wonderful hotels, even many outstanding Four Seasons around the world, but The Four Seasons Los Angeles has that something special that makes a claim in your heart. Maybe it’s the fact that everyone seems to remember your name even your first time there and they actually seem to care that you are happy. Or maybe it’s the heady smell of lilies when you walk in the entrance or the beds-- the beds that are so sumptuous that you can actually purchase them. It is a place where they serve the most delicate lemon ricotta pancakes (better than my grandmother's). It’s where I have studied my notes in the quiet of my room and prepared my questions for the talent I was about to interview and where I sat across from hundreds (thousands?) of the biggest names in Hollywood as I asked them about their films. You might think The Four Seasons would be stuffy, fancy. It isn’t. Imagine if you had a very wealthy aunt who invited you to spend a weekend at her lovely home in Beverly Hills. Now imagine her house is REALLY big. With a terrific Italian restaurant and a pool where the pool staff bring you treats while you’re relaxing on a chaise lounge (peanut butter and jelly shakes, frozen grapes, watermelon. . .) Too hot in the sun? The pool team will spray you down with a cool Evian mist and even clean your sunglasses. I’m afraid that there is one downside, however. 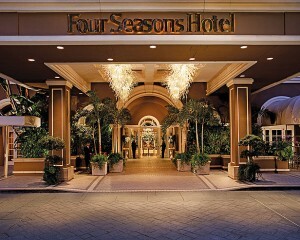 When you stay at The Four Seasons Los Angeles, ever after you will always compare other hotels to this one. The hotel has recently experienced a spectacular and thoughtful remodel, so expect gorgeous guest rooms with flat screen TV’s, new beds and updated public areas, including a new restaurant, Culina, and a dazzling patio off the Windows Lounge. There is a wonderful, almost secret patio as part of the Culina. Ask to sit here for dinner. The candlelight, fountain and ambience will make it a sublime evening. A guest room on a high floor facing east (garden view) will give you an unsurpassed view of the Hollywood Hills and the Hollywood sign. (Sleep with your curtains open and wake up to the pink sunrise.) Ask for room 1128 with the panaromic balcony. If you are an early riser, there is complimentary coffee and light pastries from 5:30 to 8am in the lobby and until 10am in Culina and the pool cabanas. The gym is outstanding first thing in the morning with floor to ceiling window panels that slide open when the weather is lovely for a fresh breeze as you run on a treadmill. Sunday Brunch is the best meal of the week here. Try the hot donuts (made right in front of you!) and a kid’s area with unbelievable mac and cheese and mini cupcakes. If you want to be pampered, if you want to know what world renowned customer service feels like, if you want to taste the best Mojito in the world (in the Windows Lounge), I hope you can book a stay at The Four Seasons Los Angeles and make it your happy place too. 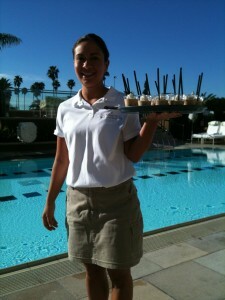 Cheers to the very first Happy Place featured on The Happygirl Experiment- The Four Seasons Los Angeles!